Confused and Anxious about your Groom Speech? “Do You Know the Startling FACT that 9 out of 10 Grooms Fail to Impress the Audience with Their Groom Wedding Speech, and? Their Speech Falls Flat. At last! The Secrets of Writing and Delivering an Exceptional and Outstanding Groom Speech are Revealed! Right Here. Right Now. 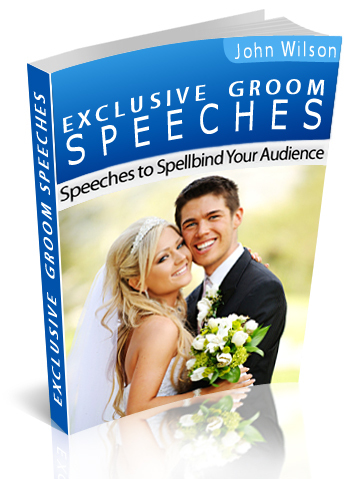 Now you can enthrall the audience with your wedding speech even if you have never written a speech or have never spoken in public all your life. 25 Time-Tested, Proven, Professionally Written Groom Speeches, a Step by Step Guide to help you write your own Groom Speech, Lots of Inspiring Wedding Toasts, Hilarious Quotations, One-liners, Tips on Overcoming Public-speaking Fears, and lots more, can be on your computer screen, within minutes from Right Now! Imagine making your beautiful bride fall in love with you yet again. Thanks to your stunning speech! Can you really afford to settle for less than this on the most IMPORTANT DAY of your life??? Do you want to lay your hands on a selection of 25 professionally written, outstanding and most entertaining groom speeches? Do you want to be able to write your own fantastc groom speech from scratch? Do you want to come up with your speech quickly and easily without putting too much mind into it? Do you want your speech to evoke humor and enthrall your audience? Do you want to deliver your speech with absolute confidence and eliminate all chances of embarrassment? What if I tell you with a couple of quick clicks my step by step guide will teach you, how to write and deliver an amazing groom speech?? with planning a wedding driving you nuts? Amongst all this unusual stuff and sometimes strange traditions (shhhhh not to be said loud) the idea of writing your wedding speech is adding to the pressure. Won’t it be great if you just had clear understanding of what is expected out of you and your wedding speech? What if you have a ready-made fantastic speech in your hands and also know the tips and tricks of delivering it effortlessly. Will make life easier. Right? Well you may have no idea what napkins go best with the linens or what flowers are the best for the occasion but when it comes to your wedding speech… you surely can’t afford to make a fool of yourself. After all it’s your wedding day! Every time you put your mind on writing your speech you are not sure what to include and what to leave out. How should I start off my speech and how exactly can I add a punch to it? How long should my speech be? Who are the people I need to thank and welcome? What if I forget what I have prepared? What if I do not live up to the expectation of my beautiful bride? What if I fail to make an impression? Or worse what if I end up embarrassing myself? Do some of these things sound familiar? Well let me be frank with you. A groom’s speech is a very critical aspect of a wedding and you are very much expected to do a good job. With my years of experience in speech writing let me share a little secret with you. If you face the audience with limited knowledge on what a groom is supposed to say…chances are you will mess it up. But that’s just one part of the story. The other part is with a few quick clicks you can come up with an Outstandingly Entertaining Groom Speech. Well all this is not a dream. It can become very much become your reality. As a Specialist in Groom Speeches I will Give you the Most Amazing Groom Speech Samples and will also Teach You Step by Step How to Deliver your Speech with Absolute Conviction, Confidence and Style. Having written several popular Wedding Speech Books and having been involved in the wedding industry for over a decade now, I will make sure you deliver a groom speech far beyond your expectations. Let me first tell you what I have been involved in doing over the past ten years or so. I spoke to dozens of wedding specialists, attended wedding seminars, interacted with renowned public speakers, read several books, researched on internet, surveyed people who have delivered wedding speeches and who are about to deliver wedding speeches (to understand their needs and expectations). Years of work has culminated into this speech package which within minutes will give you something far beyond your expectations. However writing it all down for you in the form of a speech book was not exactly my idea. No doubt the internet has information on groom speeches and you might very well find something to help you come up with a good speech. Remember there is a World of Difference between a GOOD Speech and a GREAT Speech. With the groom wedding speech samples and additional information I will share with you (which took me years to compile) you can deliver nothing but a GREAT speech. With so many years of experience and having written hundreds of wedding speeches let me share another little secret with you. DO NOT get carried away with flowery speeches or dull narrations. This is a mistake most people make and regret later when their speech is not received as well as they expected it to be received. You need a heart-warming, meaningful, touching, beautifully worded, emotional yet funny speech which will leave a long-lasting impression on your family and friends. The Speech should be a COMPLETE PACKAGE. When it comes to speeches both content and presentation are equally important. The good thing is that my material will prepare you in both of these areas. Not to mention along with this you will get lot of additional material to help you add the much needed punch to your speech. The step by step guide will also ensure you master the techniques of delivering your speech as well as overcome stage-fright. Not only will you be confident of your content but will also be prepared to confidently deliver it. The easy and simple to follow process will make it a fun and enjoyable experience for you. With so much valuable information at your fingertips you are left with only one option. To give a TERRIFIC SPEECH. And your audience is left with only one option. To utter the word WOW! Raise the Bar and Turn Your Groom Speech into an Extra-Ordinary One instead of an Ordinary Speech! Very useful and handy tips and tricks on presenting your speech. These easy to follow instructions will boost your confidence level and as a result you will come across as an experienced public speaker on the wedding day. Guaranteed! I will also teach you what body language to display, how to use particular facial expressions during the talk, how to modulate your voice and how to remain calm and composed on the wedding day. Plenty of Funny Quotations and Hilarious One-liners to add an extra much-needed punch to your speech! I am sure by now it is easy for you to understand, how valuable a tool my book is and how much it can help in enhancing the quality of your Groom Speech. However, you do not have to just take my word for it. See For Yourself What These Very Happy Customers Have Had To Say About My Groom Speech Book! It really surprised me that I could relate to most of the speeches and didn’t have to do any writing actually. Hi John….I recently got married to a woman (Jenny) who heads the creative department of an advertising agency but I have to admit when it comes to writing I am a complete jerk. That too writing a speech… that’s like asking a bit too much from a guy like me. I really didn’t want to take help from Jenny as I wanted to surprise her with my speech and make her feel special. The day was nearing and I was just freaking out about speech writing. I googled it and landed up on your page. I instantly decided to check out the book. Wo la la….I must say the book was a life saver for me. I just went through a few speeches, picked various portions of these speeches and put them all together. Just a bit of editing and my speech was ready. It really surprised me that I could relate to most of the speeches and didn’t have to do any writing actually. It was all so quick and easy. These are actually like readymade templates. Within minutes I also picked up some funny one-liners and wedding toasts for the bridesmaids, from your collection. Though I was not worried much about the presentation aspect but the tips and tricks in the book about confident public speaking, surely went a long way to ensure I was confident on the day. The hilarious opening line just did the trick for me. I had the audience with me from there onwards. Well when I finished the guests didn’t stop clapping and Jenny had a surprise look on her face. She was clearly bowled over. Later when she congratulated me I told her that after all I had to live up to the standards of a creative head of an ad agency! It was all so much fun! Thanks a ton John. May be you don’t realize how much you are helping people out there with your skill. You are doing a great job mate. Good luck. When I finished – everyone was applauding and my wife had tears in her eyes. 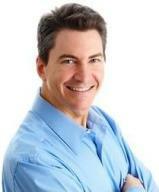 My name is Andrew and I really want to thank you John for the great job you have done. Though I really loved the idea of getting married to the woman I loved so dearly, I had no clue about the etiquettes and formalities that come along with wedding. I was in for a surprise every day with something new that came up. On top of it all I was not very aware of what exactly my speech should include. I didn’t want to offend anyone and wanted to make sure that I gave a good speech. To make it all worse the very thought of speaking in front of a room full of people, amongst all my friends and family, on the most important day of my life, was driving me crazy. I was just looking for some rough guideline to guide me in the right direction and help my creative juices flowing . When I read a few samples of your book I almost had my entire speech ready! It is far beyond a guideline. The book is a complete package! It has everything a groom can ask for and much more. I was a bit nervous before stepping onto the stage but my opening line made everyone burst into laughter. There was no looking back from there. When I finished – everyone was applauding and my wife had tears in her eyes. I was a clear winner. It felt so great! Overall it was all good fun! And thanks to you John for the help. Suddenly my speech was the hot topic of discussion at the reception. Hey John, Thanks a lot for the Exclusive Groom Speech Pack. I must say the Speech Pack is really Exclusive! I found all the material in the book very useful. It made things crystal clear in my mind. To begin with I was not even sure what is expected out of my wedding speech. The samples are excellently written and gave lot of ideas that I could use. Also the step by step guide made it such an easy process to edit and give final touches to my speech. I came to know the ins and outs of speech giving. As a result I was very confident on the day. My speech was structured so well and it flowed smoothly on the day. I could connect with people at the wedding. People were touched and genuinely impressed. Suddenly my speech was the hot topic of discussion at the reception. As a result lot of people I didn’t know came up to me and congratulated me. Amongst the formalities of wedding I had established a great connection and rapport with people. My wife just loved my speech. The DJ of the wedding came up to me and said he had never heard such a great speech before. I found the collection of wedding quotations and toasts and funny one-liners also very useful. Infact I gave some of these to my wife who used it in her speech and also on the place cards at the table. The experience will stay with me for the rest of my life. I truly recommend the groom speech pack to all the grooms to be. Thanks a lot John. I could have never done it so well myself. Weddings are truly special occasions and you really can’t afford to embarrass yourself. 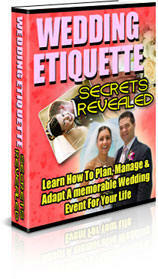 This comprehensive book will reveal all the secrets you MUST know about wedding etiquettes. Both content and presentation are equally important aspects of speech giving. If you are confident then it really shows and believe me that makes all the difference. 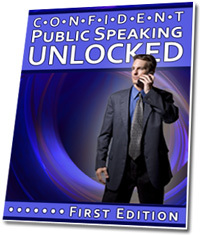 You will learn all the important facets of confident public speaking in this book. Public speeches are delivered on many different occasions, but no matter what the occasion, the speaker hopes to get the audience to accept his point of view. This purpose should be put into a sentence which is specific and concrete. A clear knowledge of the purpose in speaking is as helpful to the speaker as a road map is to the driver. The purpose gives direction to the speech and, to a degree, governs all subsequent efforts the speaker makes. Having one central idea, broken up into several sub-ideas properly selected and supported, is a means of ensuring smooth flow in a speech. As a result of this flow, the audience will believe you have given it a complete picture. In order to do this, the speech must get the attention of the audience, make the audience like or respect you (or both), and create an interest in the ideas you are going to present. 25 Brilliant, Outstanding and most Entertaining Groom Speeches. The speeches are flexible and can be easily adapted to your particular situation. They are relevant, appropriate, meaningful and impressive. They will keep your audience enthralled. Whether you need emotion, humor or substance it’s all there. Step by Step guide on Crafting your own Groom Speech easily and quickly. This is where all the speech writing secrets are revealed. This guide will help you to write your own speech as if you were a professional speech writer. About 100 Exclusive Wedding Toasts you can pick and choose from and make them a part of your speech. About 100 Inspiring and Rare Love and Wedding Quotations which you can choose from to make your speech entertaining and captivate the audience. Lots of Funny Wedding Quotations and Hilarious One-liners you can use adding a touch of humor and punch to your speech. Looking for some wild ideas to make the Bachelor Party an unforgettable experience? The book will help your best man easily and quickly plan the most unique and Exclusive Bachelor Party ever. You will find lots of themes, ideas and everything one needs to know to set the ball rolling and keep your guests enthralled. Go ahead and help your best man plan the ultimate bachelor bash! 12 sure-shot tips to make your presentation SMOOTH and to ensure NOTHING goes wrong on the wedding day. Tips on presenting your speech you MUST know before you step onto the stage to deliver your speech. This section includes guidance on all aspects of speech giving like facial expression, body language, eye-contact and voice modulation. This will make your presentation Picture Perfect! Discover how to overcome your public-speaking fears. Learn how to be calm, composed and impressive. This will help you deliver your speech in an easy-flowing, natural manner without feeling flushed. Place your order now and lay your hands on the most relevant material available on Groom Speeches and Toasts which without doubt is sure to make your speech a HUGE SUCCESS. No Questions Asked… You Will Have An Unconditional 8 Weeks Money Back Guarantee! I personally guarantee nowhere else can you find such excellent speech samples!! YES John I really want to invest in the Exclusive Groom Speech Book and want to make the most of such an important day by creating memories which will stay with me forever. I understand by acting today I will put my hands on the most relevant matter available on Groom Speeches which will help me deliver an Outstanding and Memorable Speech sure to touch the hearts of my audience. It is on this basis and trust that I am clicking the secure order button here and putting my credit card details to be able to instantly receive my ebook on sample speeches along with all the additional material and bonuses. Your Order is 100% Safe, Secure, Risk Free and Fully Guaranteed! Well, this is your life today with limited knowledge on Wedding Speeches. Imagine what possibilities you will be able to create by acting today and investing in my book. Will it not broaden your horizon? Will it not take pressure off you? Will it not RELAX you? Will it not make you confident? Will it not add fun and excitement to your life? Will it not help you create wonderful memories? Will it not give you the satisfaction that you made the most of the most important day of your life? Will it not give you that amazing sense of achievement? Well, now imagine preparing a speech without having the benefit of this book. Your mind will still be filled with all the guesswork and worries. Nothing will really change. Nothing will be different. Nothing will be extra-ordinary. Nothing will be exciting enough to be remembered forever. You will pretty much be there where you are today. So if you are ready for this kind of success and positive change and a feeling of excitement and accomplishment then there is really no decision but to click the order button below and get started…. Even if you are downloading something for the first time, the step by step easy guide to download will ensure you have no problems at all in getting the entire book on your computer instantly. And of course, with my 8 weeks 100% money-back guarantee you really have absolutely NOTHING to worry about. P.S.S. 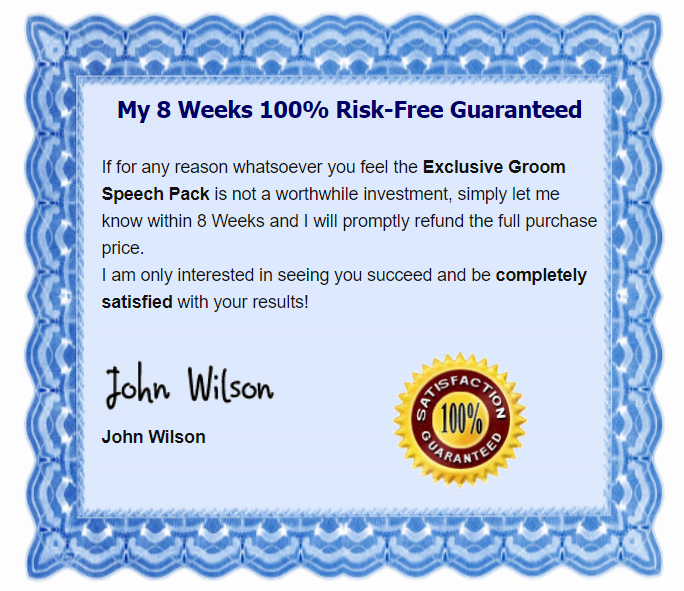 Remember you have full 8-weeks to try the Exclusive Groom Speech Pack before you decide whether you want to love it or leave it. P.S.S.S. Now is the time to ACT. If you do not then you might miss out on the reduced price offer and the golden opportunity to get your hands on so much valuable information for such a low price.